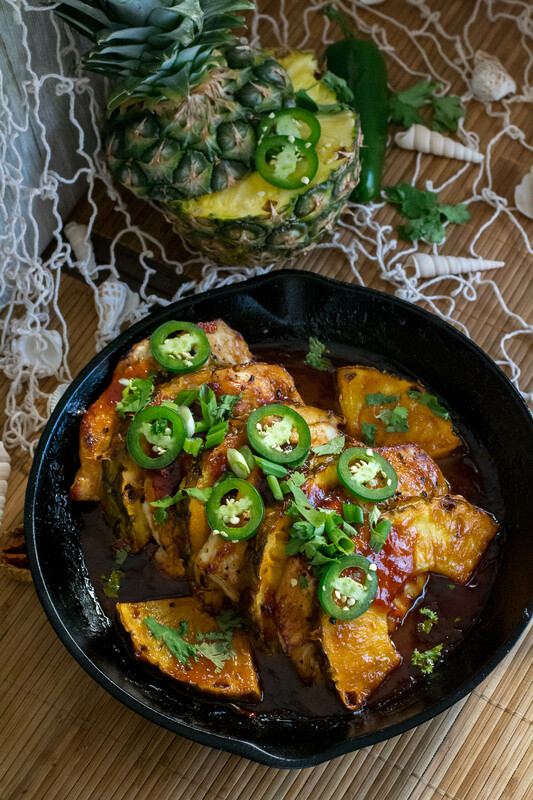 Pacific Rim Pineapple Chicken - What the Forks for Dinner? Originally I wanted this to be a sheet pan recipe. It just didn’t look right. The taste was there, but not the look. In food blogging, it’s all about the look!! Unfair as that is to be judged on looks…..if it doesn’t look good no one will make it…..I know the struggle is real. I wanted an easy meal that could come together quickly. Chicken cutlets are great for that. Already thin, boneless, skinless, they cook in just a few minutes. If you really are in a time crunch, you can use canned pineapple in this recipe, but fresh pineapple is just so darn good! Take the extra few minutes and slice it up yourself. Please note that I left the skin/peel on for photographic purposes. If you leave the skin/peel on be prepared to serve with a knife! Saute the chicken…..it only takes a few minutes, then remove and set aside. Deglaze the pan with pineapple juice. If you are using fresh pineapple, you will need to purchase the pineapple juice(I bought those little cans in the 6-pack). 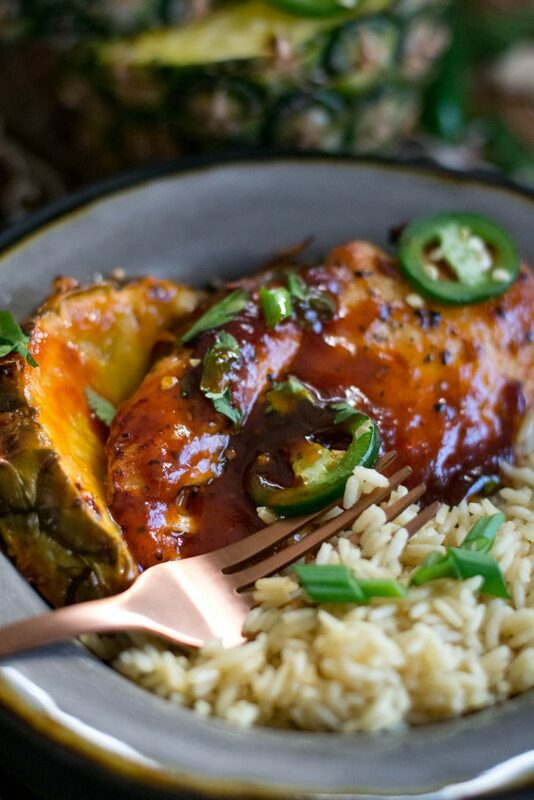 Purchased BBQ sauce makes a perfect sweet and spicy glaze when paired with the pineapple juice. I used Sweet Baby Ray’s Hawaiian, but your favorite bbq sauce will work. Add the chicken and the pineapple into the sauce and toss under the broiler for a few minutes to give it an extra glaze. Be sure your skillet is oven-proof, the last thing you want is a melted handle on a pan…the horror!!! 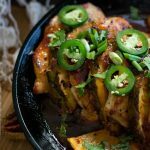 Top the chicken and pineapple with jalapeno(feel free to leave this out if you don’t want the heat), sliced green onion, and cilantro (you may also leave this out if you wish). It’s strange to me that folks don’t like cilantro, but I guess it tastes like soap to some….glad it’s not me 🙂 Serve with rice. 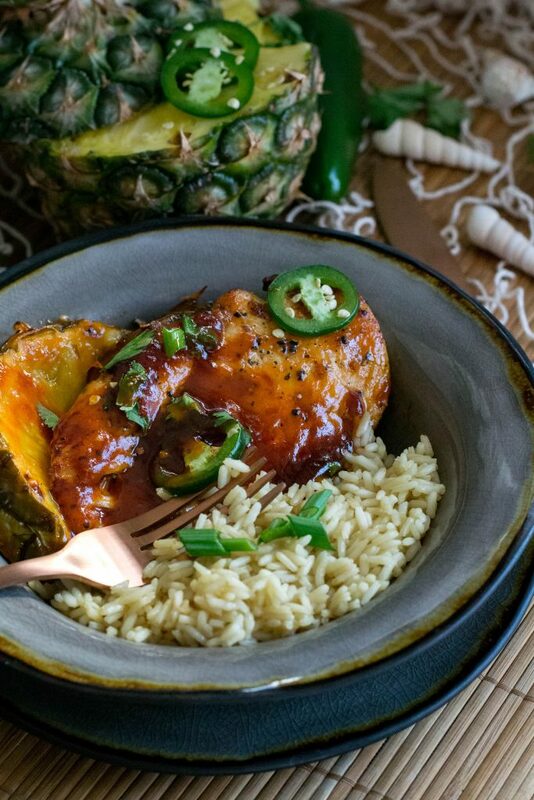 Looking for a quick, easy, delicious dinner try our Pacific Rim Pineapple Chicken! Heat avocado oil in a large skillet (I used a cast iron skillet) over medium-high heat. Season chicken with garlic pepper. Once the avocado oil is hot, add the chicken and cook until golden brown on both sides and cooked through. Remove the cooked chicken to a clean plate and set aside. Reduce heat under the skillet to low and add 1/2 cup pineapple juice. Stir to deglaze the skillet and loosen the browned chicken bits from the bottom. Stir the Sweet Baby Ray’s Hawaiian BBQ sauce to create a thick sauce. Add salt and pepper to taste. If your sauce gets too thick, add another splash of pineapple juice. 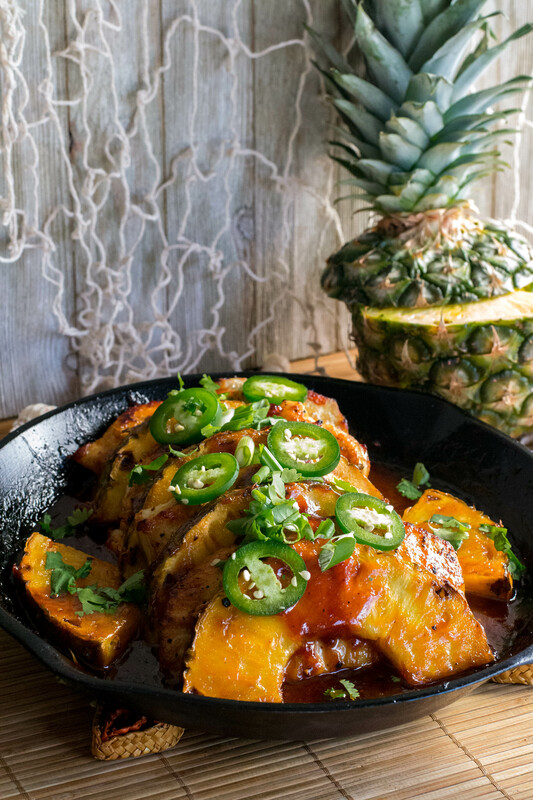 Add the cooked chicken and pineapple slices to the skillet, coating both sides in the pineapple BBQ sauce. Spoon excess sauce over the chicken. 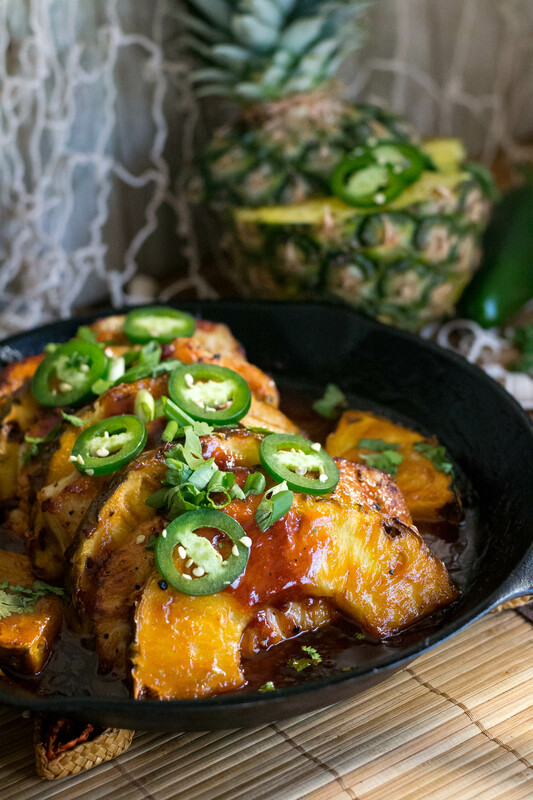 Place skillet with chicken and pineapple under the broiler for about 5 minutes, or just until the BBQ sauce caramelizes on the edges of the chicken and pineapple. Be sure your skillet is oven-proof. If your skillet is not oven-proof transfer the chicken, pineapple, and all of the sauce to an oven-safe baking dish for broiling. 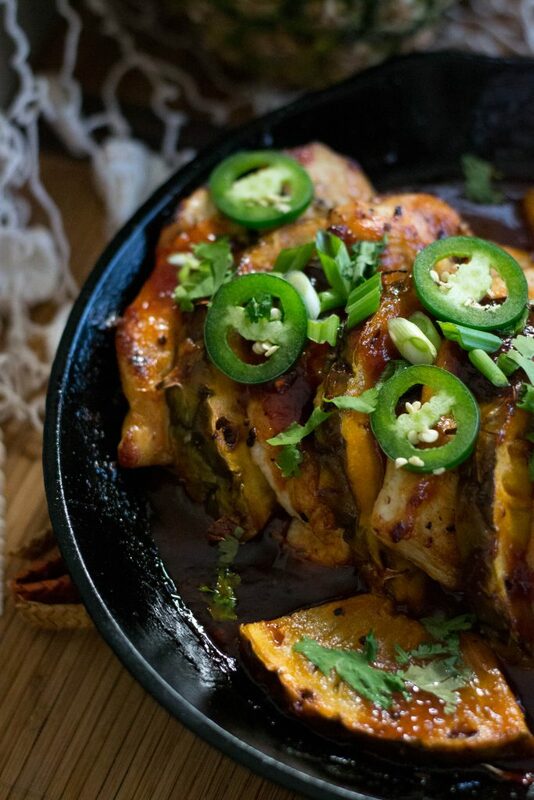 To serve, sprinkle the sliced jalapeño, green onion, and cilantro over the chicken and pineapple.